Anyone Have Experience with WANATribe? WANATribe is a site promising help for people trying to build writing careers. I read about the site in “We Are Not Alone: The Writer’s Guide to Social Media,” by Kristen Lamb. Ms. Lamb apparently maintains the site herself. I signed up to join the site several weeks ago, but my status still reads that my membership is pending approval. I understand being overwhelmed and being burned out. It takes a brave soul to put out a book with a blanket invitation to the general public to do something that causes more work for the author. I would not do it. If that is the explanation, then I understand and will devote my attention elsewhere. But if the site is functioning and other people are being approved, I would like to know so I can explore what the problem is. I just discovered that my membership has now been approved. 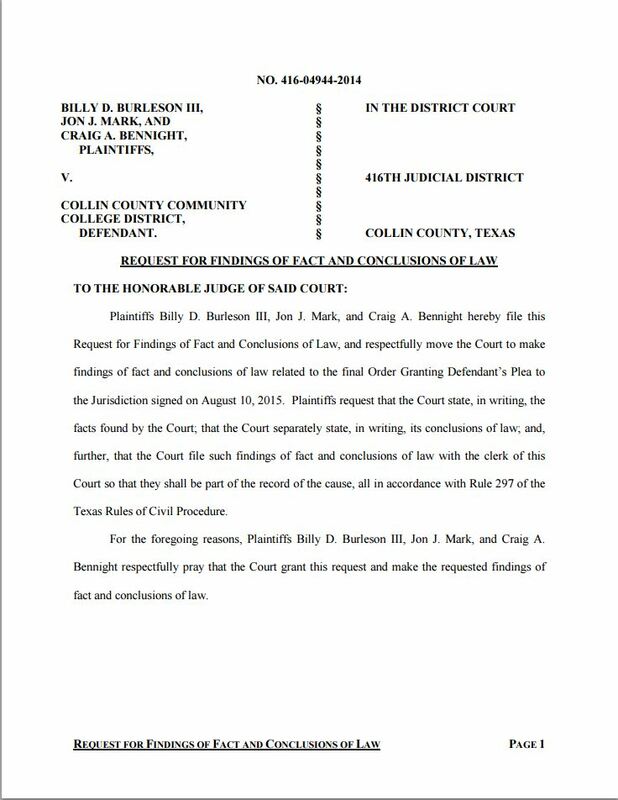 The Collin County District Court has granted the College District’s plea to the jurisdiction. That means the College District wins, and the plaintiffs lose. 1. The State of Texas, like all states, is immune from suits to which it has not consented. That means that, for a prospective litigant to be able to sue the state, the legislature must have passed a statute consenting to the suit. The principle is called sovereign immunity. 2. Political subdivisions of the state have a similar immunity called governmental immunity. 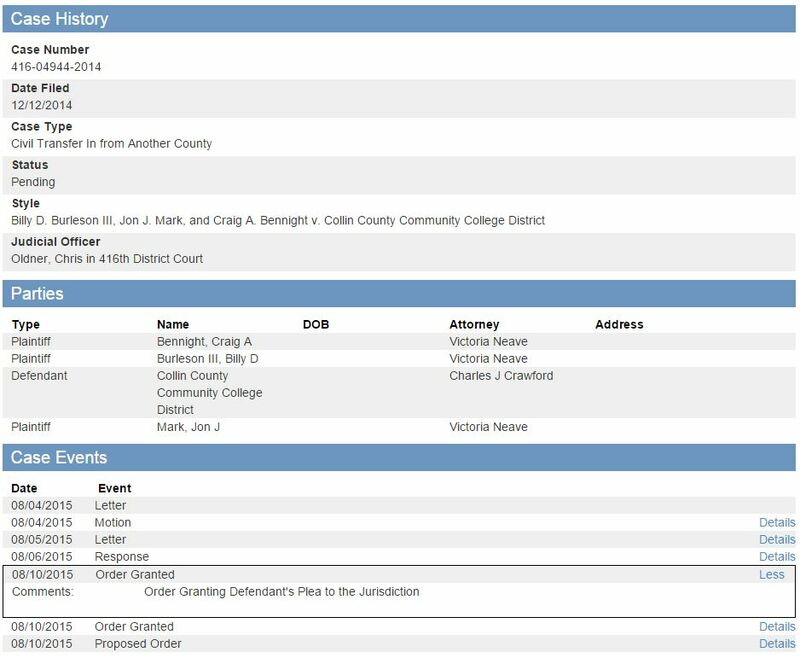 Collin County Community College District is a political subdivision of the State of Texas. 3. Thus the College District is generally entitled to immunity except where the legislature has consented to suit on its behalf. 4. To assert its immunity, a political subdivision should file a plea to the jurisdiction, the plea that the College District filed. So far, so good for the college district. It has immunity absent a waiver as to a particular suit or class of suits, and it filed the correct plea to assert that immunity. It was then up to the plaintiffs to show that immunity was waived for their suit. But the plaintiffs’ suit arose under the Texas whistle blower statute (Chapter 554 of the Texas Government Code). The prospect of governmental immunity to whistle blower suits is bizarre. The point of the whistle blower statute is to protect employees who reveal information the political entity doesn’t want revealed. If political entities are immune to the whistle blower statute, the statute offers no protection to the employee, and the statute becomes a trap for the unwary employee who may think he has protection but does not. Sec. 554.0035. 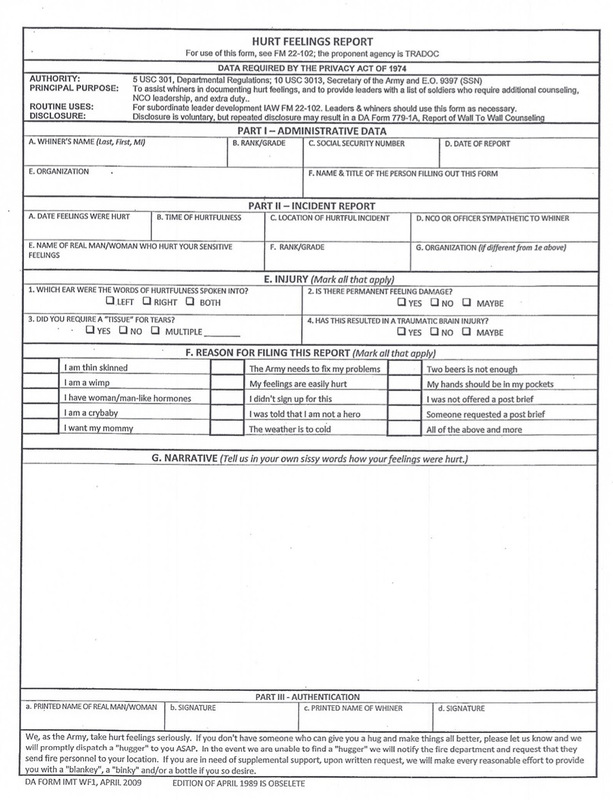 WAIVER OF IMMUNITY. A public employee who alleges a violation of this chapter may sue the employing state or local governmental entity for the relief provided by this chapter. Sovereign immunity is waived and abolished to the extent of liability for the relief allowed under this chapter for a violation of this chapter. 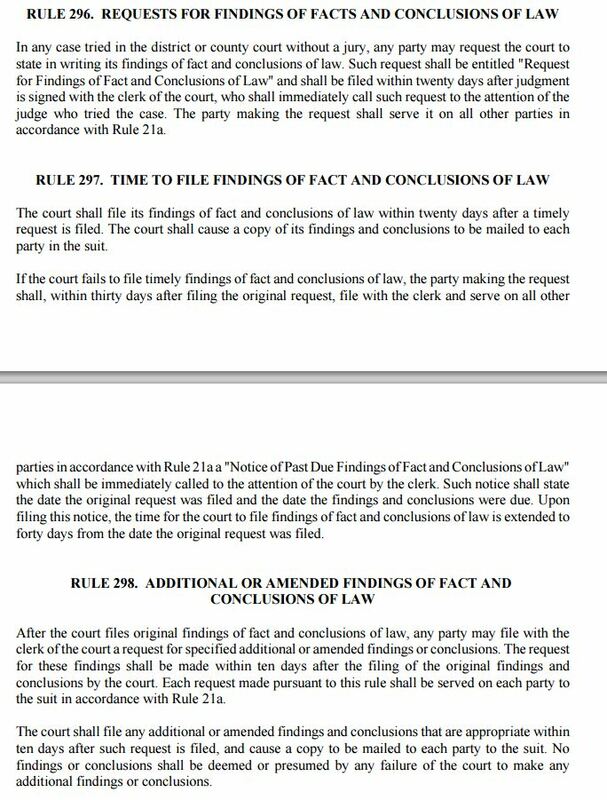 That looks like a waiver of immunity to me to the extent the petition requests relief afforded by the statute. The petition in this case requested the correct relief. The waiver is to both immunity from suit and immunity from liability. So why didn’t the district court deny the plea to the jurisdiction? I have no idea. As a cautionary note, I am not a counsel in this case, and I am not privy to everything that was presented to the court. Maybe there is an explanation for the court’s ruling that comports with the law. It’s just that I’m having a hard time imagining what that might be. Based on what I know, the ruling seems an anomaly. I am told the court’s ruling was conclusional. It is not supported by findings of fact and conclusions of law. Without those findings and conclusions, it is impossible to know why the court ruled as it did. 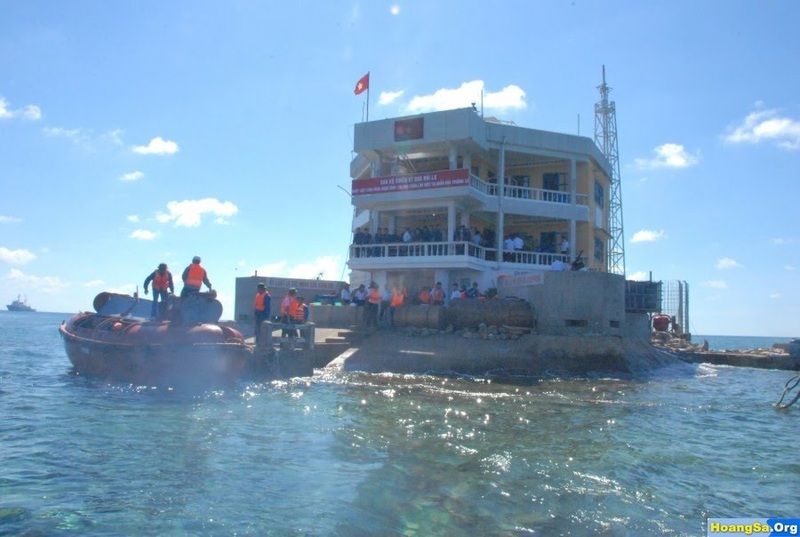 The Spratley Islands are a widely dispersed collection of small islands and reefs in the South China Sea. They are mostly uninhabited. The closest countries are the Philippinnes, Vietnam, and Brunei. In a rational world, those three countries would find a fair way to divide them up. 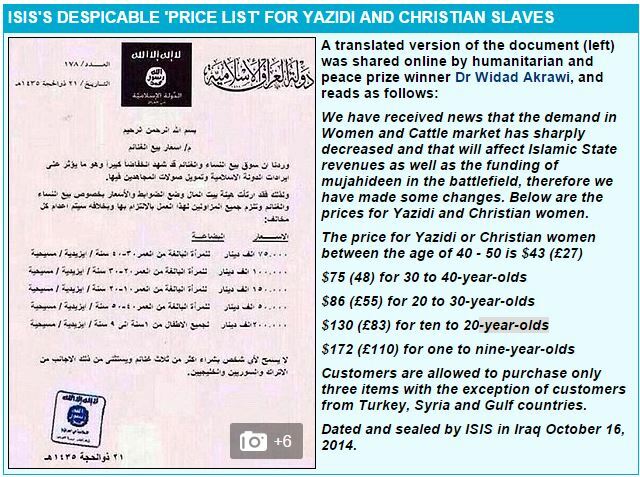 Whenever was this a rational world? If you follow the news, you will know there’s an ongoing contest between China and Vietnam for control of the area. 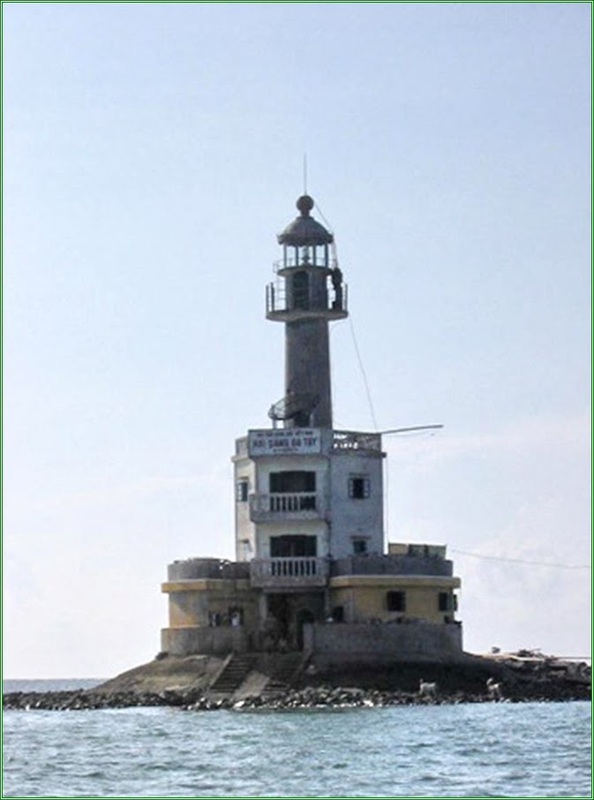 The Philippinnes would like to assert an interest, but they have not been effective in doing so. The Vietnamese effort is more substantial, but probably not militarily significant. The Chinese effort, on the other hand, shows a better grasp of how to deal with logistical problems. Things might get interesting there in a bad way. Alas. 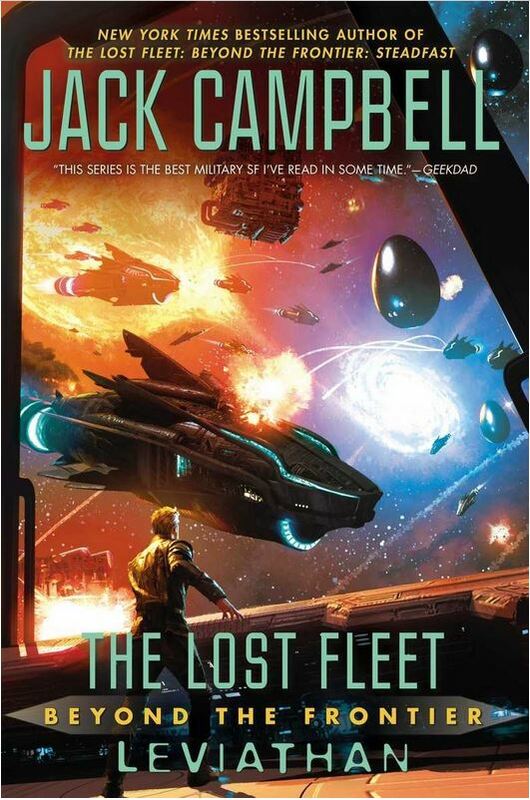 I just finished reading Lost Fleet: Beyond the Frontier: Leviathon by Jack Campbell. I’ve read the whole series to this point, and I suspect this is the end. I have greatly enjoyed all the books. If you like old-fashioned space opera, this series is for you. If you also like military-oriented books, you’ll enjoy these stories. I took the Marine option in Naval ROTC, but that was at the beginning of my third year in college. The first two years, we studied conventional naval tactics, how ships should be arranged on the two-dimensional plane of the sea. I have forgotten most of that, but I found it interesting at the time. This series goes a step farther by addressing tactics in four dimensions. Not only do the tactics take into account the ordinary three dimensions available in space, but the distances are so vast that time plays a role. For example, if your fleet pops out of hyperspace into a star system, you might see an enemy fleet that is four light-hours away. So you are seeing where they were four hours ago, and they won’t see you for another four hours. If you travel at one tenth light speed through the system, then expect it to take 40 hours to get to the enemy, depending on what they are doing in the meantime. Imagine that you are drawing close to engagement with the enemy. You have positioned your fleet in one of any number of possible attack formations. When you are just a few light seconds from the enemy and just before you are within weapons range, you might change your position to confound the enemy. If you time it right, the enemy won’t know what you’ve done until it’s too late. Of course, the enemy may be trying to do the same thing to you. If that intrigues you, read this series. Gee! My Tacoma Won’t Do That! Well, in the same sense that Lone Star is the national beer of Texas. Because of a strong El Nino, we can expect a wet fall and winter. The rain in the spring and early summer was good, but we are cooking again. Maybe El Nino will top off the Edwards Aquifer. That has not happened in a long time. By no means do I wish to make light of this year’s flooding in Wimberly and areas near it. The loss of life was terrible, and many lost their homes and other property. Tremendous hardship resulted. Life is like that. We need rain, but when it comes, it often does so with destructive force.